Here is a screen shot of a lightly stretched original frame. No preprocessing steps were taken on this image, and the light pollution is still evident. 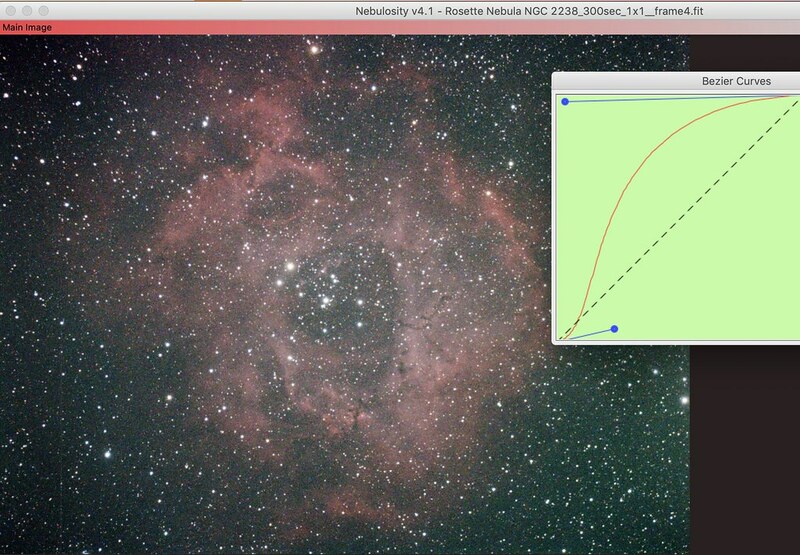 I performed an adaptive bin within Nebulosity and DDP stretch with some curve manipulation. No NR applied to this frame. During preprocessing of the posted image, I used recycled flats, bias and a "bad pixel map" dark frame substitute that Nebulosity uses during it's preprocessing work. The Atik suffers from a lot of hot pixels, which has become the primary goal of the number of successful frames that I collect. I like to have enough frames to improve the SNR by a factor of 2 to 3 or better. On this particular target, the (more sensitive) green channel was almost non-responsive. The histogram peak for green was fairly narrow (low LP) and very steep. The blue channel was more responsive, though it mimicked the green. The red channel was the primary response and a grayscale image of just the red would make a decent false luminance. Flat frames not quite working... What's up with this?